Collect points and tricks – 3, 5 or 8! Sergeant Major game, also known as 3-5-8, is an effective cure for boredom. The fact that it is the favorite game of the British (and not only British) soldiers speaks for itself. 18 deals, 3 players, 52 cards, simple but thought rules - and you can't stop it! The perfect game for good strategists and masters of planning. The one who get proper number of tricks and who has the highest score is the winner. 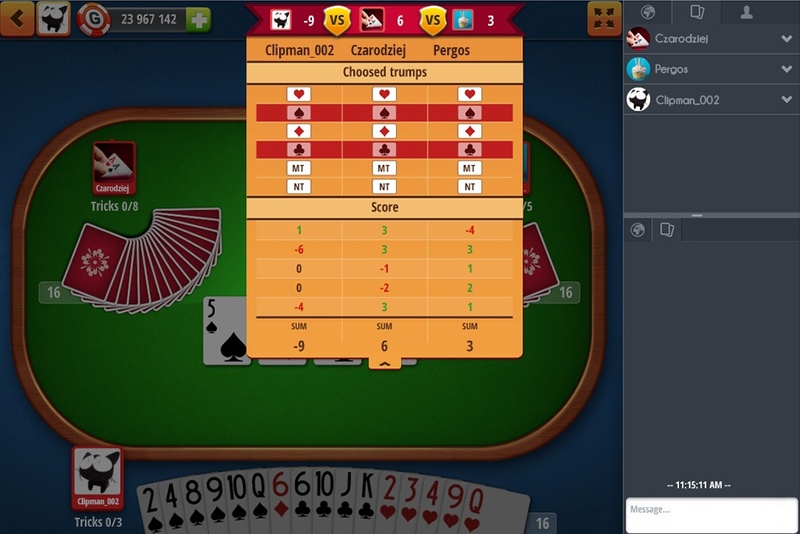 This free online card game connect players from all around the world. Test yourself. Outthink your opponents. A growing community of players all over the world make this game more and more interesting. Perfect game for beginners who want to enter the world of card games. 3-5-8: earn points, tricks, and win! Show others that you were born under the right star and that you are lucky in cards. In 3-5-8, also known as Sergeant Major, you must hit upon a good hand, demonstrate a thought-out strategy, and score more points than your opponents. Are you a determined player with strong nerves? Great, because one game of 3-5-8 could run to as many as 18 tense hands! The seniority of cards - the hierarchy, the values of the cards in the game, which are as follows: face cards, which are the kings, queens, jacks, 10, and pips (from tens to twos). Trump – a suit card that trumps other suits, which is usually determined by the elder player before the game starts. Trick - cards gained during the game. No trump - hand with no trump. Miz call - hand in which no more than the maximum number of tricks may be assembled. The game involves three players, the dealer, the elder player, and a third. The order of play changes during the game. Each of them should win respectively three, five and eight tricks during each hand, which is how the game got its name. When a player does not make the required number of tricks, they get negative points. On the other hand, a player who makes more than enough tricks gains points according to the difference between the number assembled and required. 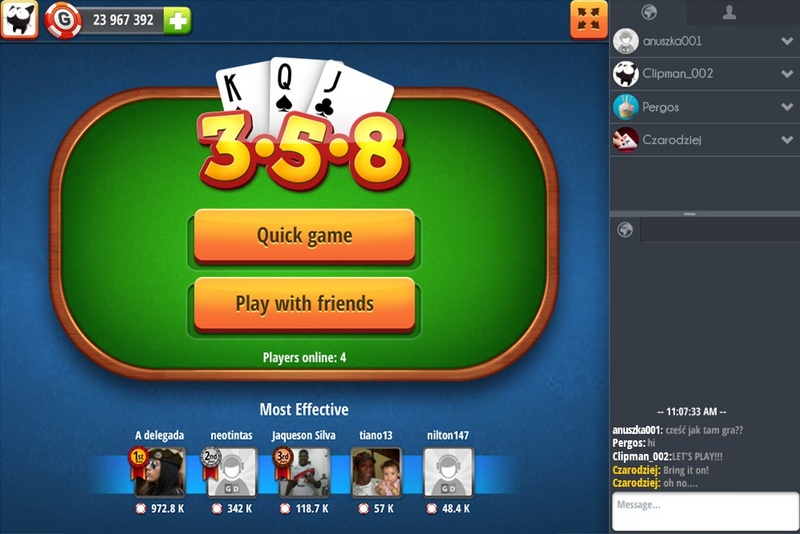 In a single game with three hands (miz call), the task of the players is quite the opposite – they must assemble no more than the required number of tricks. Dealing the cards - playing with an entire deck of 52 cards, one player deals 16 cards to themselves and the other players, leaving four in the kitty. Selecting trumps - the first player sitting to the left of the dealer called the elder player chooses trumps from the four suits. 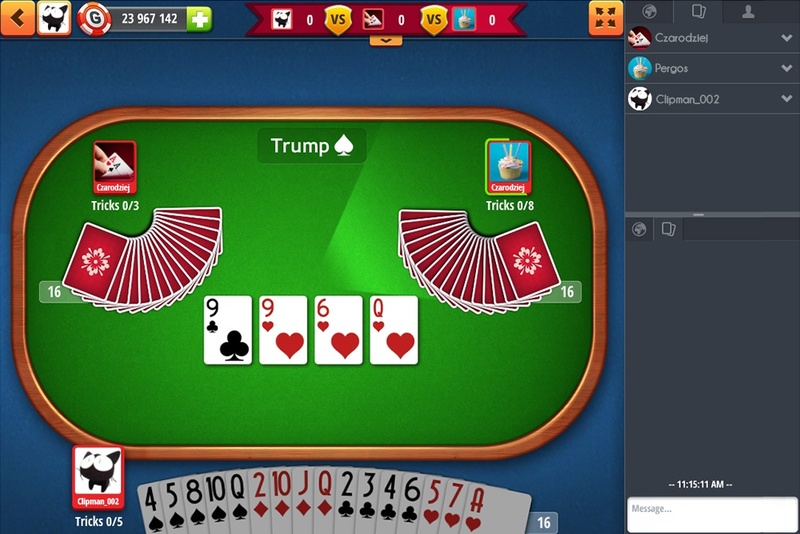 There is also a version of 3-5-8 called “no trumps”, where the whole game takes place without this aspect. 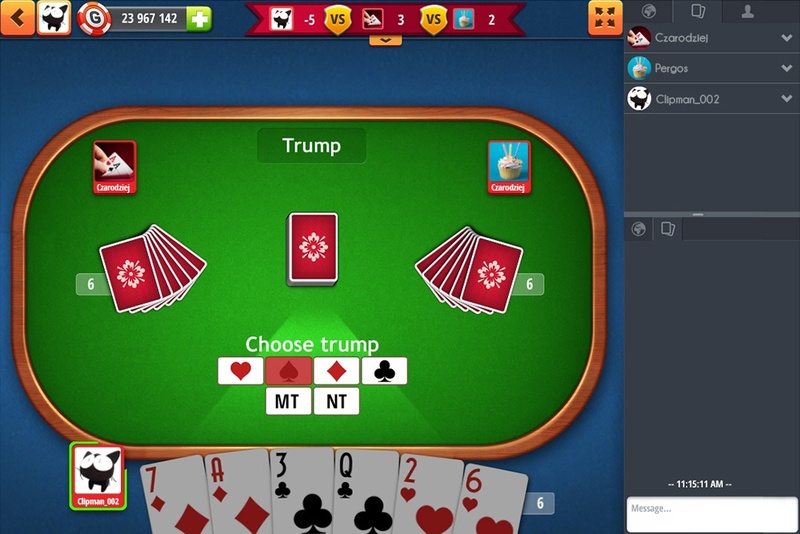 Taking the kitty - the person who chose the trump must show the cards in the kitty (usually there are four), take them, then discard any four cards which in the next hand of 3-5-8 will not be used. Leading – the person who previously chose the trump lays down the first card. Others play cards of the same suit without being required to beat the previous (better) card. If a player does not have the card of the appropriate suit by plays a trump card they win the trick. Points – scores are calculated according to different patterns, depending on starting position in the game (regular, miz call or no trump). A game of 3-5-8 ends after 18 hands, that is, when each player has chosen all the suits. The winner is the player who scored the most points for all hands. Various sources report that playing cards first appeared before the tenth century in China. In fact, they were to function as money. As time passed, cards found their way to Europe where they gained his popularity with the spread of printing by Johannes Gutenberg from 1450. A little later, the standard deck was established - 52 cards of four suits (♣, ♦, ♥, ♠). After that, games such as poker, thousand, canasta and 3-5-8 emerged around the world. Today we no longer need paper decks, and card games are moving to virtual reality, playing, for example, 3-5-8 online. You can invite friends to the game and comment in chat, or select "Quick Game" and meet new people. The possibility of playing for the highest stakes in a game (up to 1 000 000 chips!) raises the adrenaline. Thus, each winner of a 3-5-8 game can accumulate quite a number. It is worth a try now. Simply register quickly on the GameDesire site. Play from home with opponents from around the world!